CITA President Rong Chhun speaks yesterday at a press conference in Phnom Penh. The president of the Cambodian Independent Teachers Association requested yesterday that his union be included in an upcoming education congress hosted by the Ministry of Education, Youth and Sport. The congress, which starts on March 22, “will be attended by over 1,000 district, provincial and national MoEYS officials … and education NGOs”, according to a CITA statement. 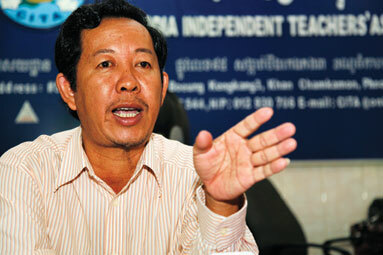 CITA President Rong Chhun said teachers from his association have not been invited to the congress, which will discuss the nation’s education policies. Rong Chhun said he issued a letter yesterday to Education Minister Im Sithy, requesting that representatives from CITA be invited to the congress. Im Sithy could not be reached for comment yesterday, while Secretary of State Pith Chamnan said he couldn’t comment because he was in a meeting. CITA’s statement invoked commitments made under Article 29 of 2007’s Education Law to include national organisations and “relevant stakeholders” in the development, drafting and amending of national education policies. Under Article 37 of the law, it states that educational personnel have the right “to actively and fully participate in developing educational standards at local and national levels, directly or through their representatives”. “This is the ministry’s discrimination against CITA, which works for teachers’ benefits and raising the quality of education in Cambodia,” said Rong Chhun.